Small, round-headed Japanese maple cultivar with grey bark, dark red young branches, and burgundy foliage. Toothed leaves, 8-12 cm long, with five lobes and possibly one or more small lobes at the base. Leaves usually hold their colour well into summer, but may fade in hot sunny areas, before turning crimson to bright scarlet in autumn. Insignificant red-purple flowers in spring, followed by samaras (winged fruit) in autumn. Synonym: Acer palmatum var. atropurpureum 'Bloodgood'. Some variation in appearance is possible since there is more than a single clone available under this name in the trade, and sometimes seed-propagated (as opposed to grafted) trees are also offered for sale as Acer palmatum 'Bloodgood'. Likewise, the name Acer palmatum 'Atropurpureum' has been used for more than a single clone. Hence the differences between Acer palmatum 'Bloodgood' and Acer palmatum 'Atropurpureum' may not be as clear as between the original selections. Prefers a sunny position or, in particular in areas with hot summers, a partially shaded site. Any well-draining soil. Protect from strong winds. Prune lightly for shape once a year during winter. Frost hardy. 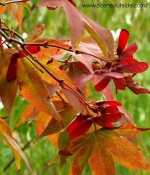 One of the most popular red-purple maples with good colour retention during summer. May also be grown as a shrub. Use as a specimen tree or accent plant for foliage colour, and repeat a similar colour elsewhere in the garden (e.g. with Loropetalum chinense 'Burgundy') to create a link with the surrounding planting. Perfectly suited to Japanese style gardens. Deciduous tree with broad, rounded canopy. Mid green, 7-lobed leaves with toothed margins, 10-12 cm long. Foliage turns orange-red in autumn. Bright red, winged fruit in early autumn. Suitable for a sheltered position in full sun and any well-draining soil. In areas with hot summers, Acer palmatum 'Osakazuki' likes shade from afternoon sun. Fertilise once a year. Remove damaged or dead branches. Protect from strong winds. Water during hot dry weather. Japanese maple with brilliant autumn colour and beautiful fruit. Makes a wonderful focal point in autumn. Can be grown in a large container for several years. 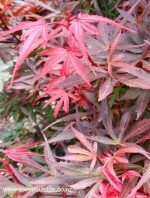 Compact, upright-growing (as opposed to spreading) Japanese maple with burgundy foliage and bright red young leaves. Branches are formed from ground-level. The foliage turns a little bit darker in colour during autumn before leaf fall. Prefers a partially shaded, sheltered position in any fertile, well-draining soil. Generally pest and disease free. Young foliage may be damaged be late frosts. 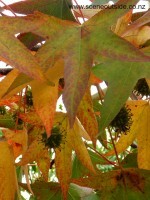 An attractive small maple with brilliant foliage colours. Perfect for a sheltered garden that needs some height, but lacks the space required for trees with spreading canopies. The foliage colour combines beautifully with Loropetalum chinense 'Burgundy' which can be used as a link between the canopy of Acer palmatum 'Shaina' and lower-level layers in the garden. Also suitable for large containers. Deciduous shrub or dwarf tree with finely divided, palmately lobed leaves. The burgundy-red foliage turns bright scarlet in autumn. Small, reddish-purple flowers in spring. Branches are cascading, unless the plant is pruned quite hard each year. Gradually increases in height by mounding over itself. Prefers a sheltered position in any well-drained soil. Tolerates sun, but is happier when partially shaded, in particular in areas with hot summers. Trunk height can be influenced to a degree by selecting a strong leader when the plant is young, and staking it to the desired height. A delightful small maple with delicate foliage that retains its gorgeous reddish-purple colour throughout the summer. An obvious choice for gardens with an oriental theme, but 'Crimson Queen' can be incorporated in many different garden styles, including tropical and cottage gardens. The weeping growth habit with branches reaching down to the ground, looks beautiful next to ponds. Suitable for containers. Small deciduous, round-headed tree or large shrub with burgundy-coloured foliage and large pink 'clouds' of tiny flowers in summer. The leaves emerge wine red in spring, gradually darken during summer and finally turn scarlet red in autumn. The sap may cause skin/eye irritations. Raised in the UK during the late 1970s, 'Grace' is a hybrid between the cultivar 'Velvet Cloak' of Cotinus coggygria (European smoke bush) and Cotinus obovatus (American smoke tree). Prefers a sunny position for best foliage colour. Grows in any soil-type as long as it is well-drained. Tolerates poor soil. Can withstand periods of drought once established. Vigorous when young. Responds to pruning. Frost-hardy (zones 5-10). Beautiful plant with striking foliage colours throughout the growing season, and tiny flowers in large panicles that resemble smoke-like plumes. Use as a focal point, and repeat the foliage colour in lower-growing shrubs elsewhere in the garden. Large deciduous tree with pinnately compound, green leaves, turning claret red to plum purple in autumn. Inconspicuous flowers in spring. Narrow, upright growth initially, broad-headed when mature. Chance seedling of Fraxinus angustifolia subsp. oxycarpa, discovered in a South Australian nursery, and subsequently grown on at the nearby Raywood property. Also known as Fraxinus oxycarpa 'Raywood'. Prefers full sun and well-drained soil. Can be grown in any soil-type, although surface roots may become a problem in clay soils and wet sites. Frost hardy (USDA zones 6-9). Striking foliage colour from early autumn onwards. In spring and summer the foliage is also attractive, in particular from a distance where it seems to have a plume-like texture, waving gracefully in the wind. Makes a beautiful specimen tree. Not suitable for very exposed sites. Near my home they are planted as street trees, and after strong winds there are always some that have lost quite large branches. Large deciduous tree with a broadly conical outline. Native to southeastern United Sates, Mexico and Central America. Maple-like leaves, 7-13 cm wide, with 5 to 7 lobes and toothed margins. Spectacular autumn foliage display in shades of burgundy, red, orange and yellow. Inconspicuous greenish flowers in spring. Pendent, spiny, spherical fruits are produced by mature trees. These are green initially, turning dark brown later, and persist on the tree well after the leaves have fallen. Commercial hardwood in the US. The genus name refers to the resin exuding from the tree when wounded. Several cultivars are available with various growth habits and autumn colours. Suitable for a sunny or partially shady, and reasonably sheltered position in any, preferably neutral to acidic soil. Copes well with less than ideal drainage. The photograph of the tree-outline in winter was taken near a stream in an area that occasionally floods. Leaves turning yellow between the veins may be an indication that the soil is too alkaline (in particular when it is also lacking in organic matter). Striking shade tree with brilliant autumn foliage. Attractive when in fruit, especially after the leaves have fallen, but fruit litter may be a problem where Liquidambar styraciflua is planted on the lawn, next to foot paths or near gutters. There are non-fruiting cultivars, such as 'Rotundiloba'. Cultivar of Liquidambar styraciflua, growing into a dense, multi-stemmed shrub, but is usually grafted on a .6-1.8 m long standard, forming a small 'lollipop' tree with a dense, rounded canopy. Mid green, maple-like leaves to about 12 cm long. Leaves persist for a long time and turn shades of yellow, orange, red and burgundy before falling in winter. Inconspicuous greenish flowers in spring. On the species itself these flowers develop into spiny, spherical, green fruit during autumn. Prefers a sunny position, but tolerates partial shade. Suitable for a wide range of soil types, including sand and clay soils. Performs best in well-draining soil, but tolerates wet conditions. Usually forms a ball-shaped canopy with little or no pruning, but can be pruned in winter. Frost-hardy (zones 5-11). Gorgeous focal point tree for small spaces. Makes a good container specimen for your patio. Lush spring and summer foliage, and lovely autumn colours. Vigorous, ornamental cherry, flowering in spring with masses of slightly fragrant, pale pink-white, single flowers. Foliage turns yellow and orange in autumn. 'Awanui' (and Prunus x yedoensis itself), is propagated by means of grafting, but also roots easily from cuttings. Usually it is top-worked, i.e. grafted at a higher level as opposed to near ground-level) to form a clear-stemmed tree with layered branches. Attracts birds, bees, and butterflies. 'Awanui' is a cultivar of the Japanese Prunus x yedoensis, also known as the Yoshino cherry. It was selected by the New Zealand nurseryman Keith Adams. 'Awanui' was the name of the street that gave access to his property, and is the Maori world for gully. Prefers a sunny position in any well-draining soil. Provide some shelter to prevent flower damage and prolong flowering. Good disease resistance. Frost hardy (zones 5-9). An avenue with a row of flowering Prunus x yedoensis 'Awanui' on either side is breathtakingly beautiful. Make sure you have sufficient space for this gorgeous tree as it gets quite wide.